Sorry, the Belleek piggy bank is sold out. This Belleek piggy bank features hand painted accents along with green shamrocks and it is suitable as an Irish baby gift. 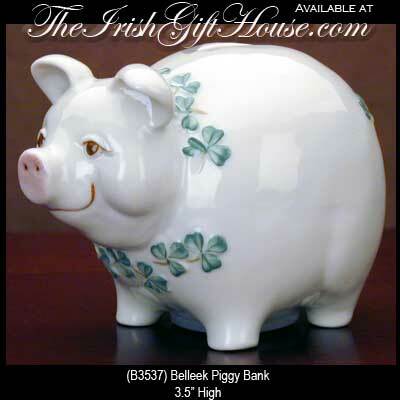 The shamrock piggy bank measures 3 1/2” tall and has a removable rubber plug under its belly. This piggy bank is hand made in Belleek, Ireland and it is gift boxed with a shamrock history card, complements of The Irish Gift House.